The former treasurer of the Patterson Fire Department, Albert Melin, pleaded guilty Wednesday in U.S. District Court to charges of wire fraud and false subscription to tax returns for embezzling more than $1.1 million from the volunteer fire service… Please login below or purchase a subscription to the Putnam County Courier to access this content. Putnam County Elections Commissioner Anthony Scannapieco has assured the public that local voters balloting on Election Day have nothing to worry about as to whether their vote will be tallied properly. Some residents expressed concern that machines… Please login below or purchase a subscription to the Putnam County Courier to access this content. Some 62,000 registered voters are eligible to head to the polls next Tuesday to cast ballots for national, state, county and town contests. In addition to – GO voting on contested races for President, Vice President, U.S. Senate, Congress, State Se… Please login below or purchase a subscription to the Putnam County Courier to access this content. Left: State Senator Terrence Murphy makes his point at Brewster’s get together. 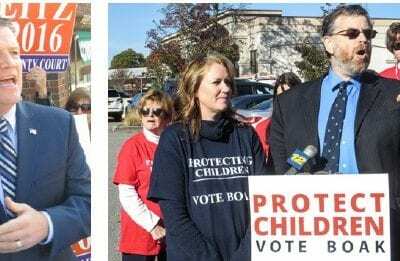 Right: At Tuesday’s Ali Boak rally in Mahopac, Gary Greenberg, founder of the Fighting for Children PAC, screams at a heckler while the candidate stands by hi… Please login below or purchase a subscription to the Putnam County Courier to access this content. A Mahopac Falls couple faces felony charges for allegedly bringing their two infants, aged three weeks and two years, to a drug deal in Mahopac that was set up as undercover sting by the Countywide Narcotics Task Force. Captain William McNamara iden… Please login below or purchase a subscription to the Putnam County Courier to access this content. Vietnam vet, Charlie Sanchez of Mahopac, stands with pride when announced at the dinner. 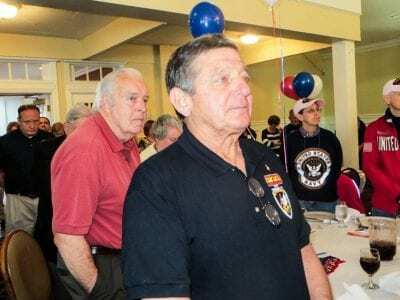 More than 100,000 veterans call the Hudson Valley home and on Sunday, more than 400 of these brave men and women were recognized at Putnam County’s 2016 Ve… Please login below or purchase a subscription to the Putnam County Courier to access this content. 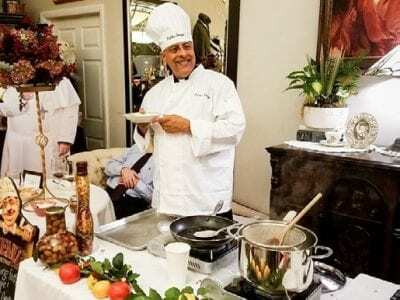 Father Any Sorgie prepares Italian delicacies at an international fundraiser in Carmel last week. Father Anthony Sorgie received a hero’s welcome last week when returning to Carmel. One of the region’s most loved, respected and revered cl… Please login below or purchase a subscription to the Putnam County Courier to access this content. 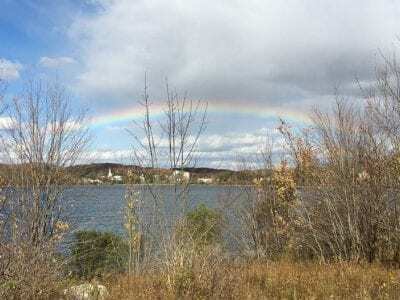 The Putnam County seat was adorned by a rainbow on a chilly fall afternoon viewed from the western side of Lake Gleneida. This beautiful photo was taken by Jeff Hyatt. 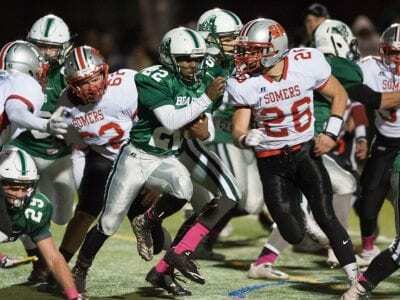 … Please login below or purchase a subscription to the Putnam County Courier to access this content. Credit it to a school night, but area police reported one of the quietest Halloween celebrations across Putnam County in years. Added patrols were on the ready to respond for mischief makers’ however, police on the village, town, county and st… Please login below or purchase a subscription to the Putnam County Courier to access this content.